As my junior year at Grove City College flew by, I knew that the upcoming summer was imperative for me to explore the “real world” and gain as much experience as possible in what I am passionate about: creativity and integrated marketing communications. These interests sparked my search for an internship at a Pittsburgh advertising agency, and instantly, Apple Box Studios caught my eye! Their work as an ad agency is unparalleled in its creative messaging and visuals, and when I was told that I had the opportunity to join this team as a marketing communications intern, I was beyond excited! Stepping into the office my first day on the job was really intimidating (I mean, who wouldn’t be a little afraid of a group of creative geniuses all together in one place?!). But immediately, I felt SO welcome by every member of the team. They were so kind and patient in helping me learn the ropes of the agency and explaining my role in each project. Even the owner, Mike Wertz, consistently took time out of his crazy, busy schedule to check up on me and make sure that I was involved and enjoying my time here. 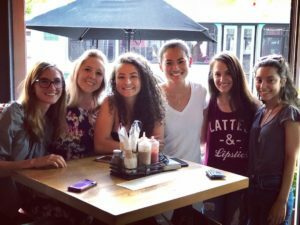 As a team, we were able to bond and have fun together both inside and outside the office, including some happy hours, Starbucks trips, Ducky Tours and some delicious Moe’s catering! 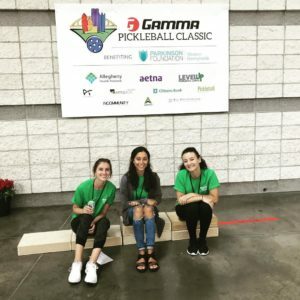 Throughout the summer, I was able to work with everyone and help the team in numerous ways, including the Gamma Pickleball Classic 2018 (which was a BLAST and a MAJOR success!). I had the opportunity to assist the amazing Account Executives, Alyssa, Lisa and Dan in a lot of work for their clients. It was so rewarding to be able to see my contributions play a part in the final project’s success and the client’s satisfaction. 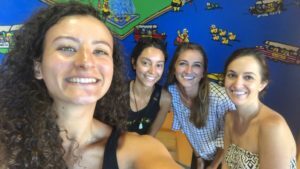 With these creative people, I was able to explore the areas of integrated marketing communications through working with clients’ websites, videos, and social media. The knowledge and experience that I gained from them is undoubtedly more than anything I could have learned from a textbook. Being able to partake in the daily life of an ad agency was an amazing experience, but meeting and working with the people at Apple Box Studios was an even greater one. It’s no secret that this ad agency produces incomparable work for each of their clients and I was beyond lucky to spend my summer with them and learn how it’s done. Thank you, Apple Box Studios, for an unforgettable summer and preparing me for a future in integrated marketing communications!